Place the apple in a bowl and sprinkle with half the lemon juice. Peel the celeriac and slice thinly, then cut the slices into thin matchsticks and add to the apple. Mix in the mayonnaise and season. Preheat the grill. Cut slashes into the skin of the mackerel and season. Grill for 4-6 minutes, turning once, until the skin is crisp and the flesh cooked through. 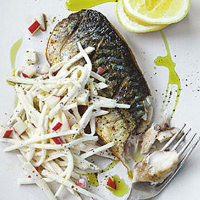 Arrange the mackerel and remoulade on plates and sprinkle with the remaining lemon juice before serving.